1. The Co-op is open to IAGARB members only. 3. Participating members will send their fiber in 5-pound lots. 4. Participating members will send two copies of the participation form with their fiber. 5. Each participating member will pay the mill directly by credit card. The Co-op is one of the benefits enjoyed by our membership. It is available to German Angora producers who wish to participate in the creation of millspun German Angora yarn. If we, as a co-operative group cannot produce an excellent yarn – then there is no point in proceeding. German Angora fiber mills very well. The rabbits have been specifically selected to produce fiber with a texture that is resistant to breakage during processing. If we all begin with the same quality of adult prime German Angora fiber, then it is reasonable to expect that we will all enjoy the same high quality of finished yarn. Fiber that has not been sorted, properly graded, or is too short, matted, stained, found to be too fine (young or other angora) will cause the entire 5 pound lot to be returned at the participating member’s expense. In order to simplify the fair division of the yarn run, everyone needs to send in fiber in equal increments of 5 pounds. If you have more fiber than 5 pounds then you are welcomed to send in 10, 15, 20 or more pounds. Added wool and other fibers (nylon for socks) will affect the finished weight of the returned yarn. Some percentage of milling loss is expected but we won’t know what that is until we have the finished weight. These variable factors make it necessary to base to final division on percentages. If everyone sends in fiber in equal increments, portioning will be much easier. If you wish you combine your German Angora wool with another IAGARB member – that is fine. You and your friend can divide up your yarn on your own. Please send only one credit card number and one shipping address with that wool. Kindly verify the weight of your fiber on an accurate scale. This is very important. Everyone’s wool will be reweighed at the mill. Making sure that your wool is properly weighed is vital to the smooth operation of the yarn run. In order to compensate for variances, please include 2 additional ounces for each 5 pound lot. If you are not certain of the accuracy of your scale, please weigh on the heavy side. We may not have the time to hold the entire order while someone sends in 4 more ounces of wool. 4. Participating members will send two copies of the participation form with their fiber. The Wool Co-op Participation can be found at the end of this article. Kindly fill out all fields and make sure to clearly indicate in which yarn run you wish your fiber to be included. 5. Each participating member will pay the mill directly by credit card. Zeilingers Woolen Mill will charge your credit card directly for the other fibers used, processing the yarn, shipping and handling. We have no control over changing prices at the mill. Please review current pricing information available on the Zeilinger web site. So far, all of our members agree that the skeining service is definitely worthwhile. Skeining pounds of yarn by hand is tedious and can result in a pretty sore shoulder. Expect some variance in mill skeined weights. Most skeins are in the 55 to 64 gram range after washing. Skeining by hand yields similar variances. If you have questions about the yarn or the completion date of a particular yarn run, please do not contact the mill. Ask the IAGARB person in charge of the Wool Committee listed on our web site. Different grading systems are used for different end purposes. The wool grading system described in the IAGARB standard is a good foundation. We will use a modified version for our yarn co-cp. Please refer to it on the IAGARB website. The objective of the co-op is to create a yarn of outstanding quality. It is also important that everyone contribute the same high grade of fiber. Good stuff in – good stuff out. Angora wool is measured by the length of the underwool staple. In any lock of angora, these fibers make up the bulk of the wool. Guard hairs and awn hairs stand above the underwool. They are longer. We will not use awn or guard hairs to measure the wool length. The most desirable angora for this purpose will have an underwool staple length of 3 to 4 inches. This is also the length usually available at the end of a 90 day shearing period. The adult (more than 9 months old), albino, German wool should be snow white, healthy and free-falling. Fiber that is clearly not German type in its texture will be returned. Plucked fiber will not be allowed. Fiber that is too fine or too young is not acceptable. Too short – less than 3 inches. Short fibers “fly” away during processing and add to processing losses. Too long – more than 4.5 inches. Angora wool more than 4.5 inches will not be allowed as it has a tendency to become caught in the commercial carders and stays on the machinery instead of the yarn. This will contribute to processing losses for everyone. Webby or matted fiber will not be accepted. Fiber with urine or any other discoloration will not be allowed. Dry urine flakes off as a powder during processing. This fine air born irritant causes eye and respiratory distress to the mill staff. Fiber stored in or contaminated with moth balls or any other chemical or additive will not be allowed. For instance cornstarch or other substances in the fur for any reason is considered an additive. Fiber with vegetable contamination is not allowed. Fiber with obvious dander will not be allowed. Dander in wool indicates mite activity. Where there are mites, there is usually fiber damage. Fibers weakened by mite damage will have a tendency to break during processing and will increase the percentage of loss to “fly”. Once you have sorted your wool, please pack it inside a plastic bag to protect your dry fiber from any possible water damage during shipping. Pack the bag in a good cardboard box. You do not need to lay the wool in tidy rows or separate the layers with tissue paper. Please include two copies of the participation form inside the box. It would be a good idea to insure your shipment – but that’s up to you. Ship your wool so that it arrives before current deadline. All of the wool will be checked to verify grading and weight. 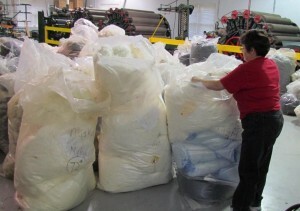 The first step in processing our fiber into yarn is picking. This is done with a picking machine that evenly blends all of our materials together. The Picker blows the blended fibers into an enclosed space. It is gathered up from there and transferred to the carding hopper. From there it moves up the spike apron and onto the actual carding machine to be blended further as the fibers are combed and oriented into proper alignment for condensing and spinning. Of all of the natural fibers processed in spinneries, angora is the worst for creating fly. The flying fibers are a nuisance in the spinnery. They land on everything – including the employees and do not end up in the final yarn. Because the mill bases its price on finished yarn weight, and because cleaning up a fine frosting of angora in the mill is a pain, it is absolutely in the best interest of the mill to control the fly as much as possible. No one deliberately takes the fiber. It is not sold or stolen. “Fly” simply has escaped processing bit by bit through the different stages. It ends up on the floor, in the garbage, in the trees outside and in the employees’ lunch. These losses are part and parcel of the process. As angora producers, we need to recognize that 1. It is normal. 2. Worse for angora than any other natural fiber. 3. Absolutely part of our cost of production and must be included in our pricing considerations. Because the percentage of fly is slightly different for each run of yarn, a fair division of our yarn is based on the fact that everyone contributed in increments of 5 pounds. Zeilingers has treated IAGARB very well with regard to turn around time. They have processed our fiber into in as little as two weeks and as much as three months when they had a back-up of other orders. Considering the wait many people experience at other mills of 6 months or more, Zeilingers has handled our fiber promptly. We will keep you updated on the IAGARB chat list as to the progress of each yarn run. Washing Your Yarn When your yarn comes back to you, it will be on cones or will be in skeins if you have ordered them. It will not look much like the fluffy yarn you expect. The yarn will look like skinny, grayish string. Have faith. If you have not ordered skeins, wind your yarn off on a niddy-noddy or skein winder. Tie each skein loosely in four places to keep it from tangling. Handle your skeins gently as you soak them in very hot but not boiling water with whatever detergent you like. We find that any sort of liquid laundry soap works well. Detergent is necessary to remove the grayish spinning oil and the natural rabbit skin oils. Let the water cool a little – 10 or 15 minutes and then carefully remove each skein from the soap bath. Rinse out the soap with a second soak in cool water. Squeeze out excess water but do not wring the yarn. Because the spin cycles on washing machines vary considerably from make to make, we do not recommend that method for removing excess moisture. You are, of course, free to experiment at our own risk. Salad spinners always do a good job of gently removing water, albeit in small batches. Dry yarn flat. When the yarn was originally spun, it was under tension. Washing relives that tension, causing the yarn to rebound. Rebound significantly shortens the length of your yardage. All of this is normal and expected. After the yarn is dry, you will be relieved to see that it has plumped up considerably and has developed the characteristic angora nap. The nap will continue to grow as you work with the yarn and wear it.